Bring Me Their Hearts was everything I was hoping for when I laid eyes on this beautiful cover! This book was an enchanting, addicting, and unforgettable! I COULDN'T PUT THIS BOOK DOWN! The world the author created for this story was so unique and mesmerizing. The history and lore of this world were so fleshed out and it never felt like the information was given in info dumps. I loved learning about the culture, politics, magic, and the many conflicts brewing. With all of the schemes, intrigue, secrets, and rivalries in this book, I was on the edge of my seat! I felt the same pressures and anxieties Zera did when she was trying to navigate the rocky waters of this world. The main character, Zera, WAS THE SASSY FEMALE CHARACTER OF MY DREAMS! She was never afraid to say what was on her mind, which lead to some hilarious moments in this book. Zera was a complicated character that had A LOT going on, and I thought the author did a great job at developing her and showing the internal conflicts she was constantly facing. I also LOVED Lucien. OH MY LANTA, HE WAS SO DREAMY. His relationship with Zera made me swoon SO MANY TIMES. Their relationship was full of passion and banter, which filled my heart with so much joy. I thought their relationship developed at a believable pace that managed to make me beg for more. 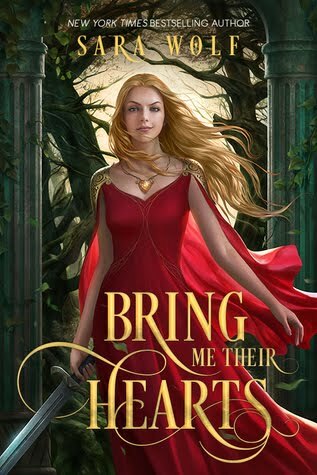 Overall, Bring Me Their Hearts was a thrilling adventure that sucked me in from the first page. This book was a delightful surprise for me, and I cannot wait for everyone to read it!